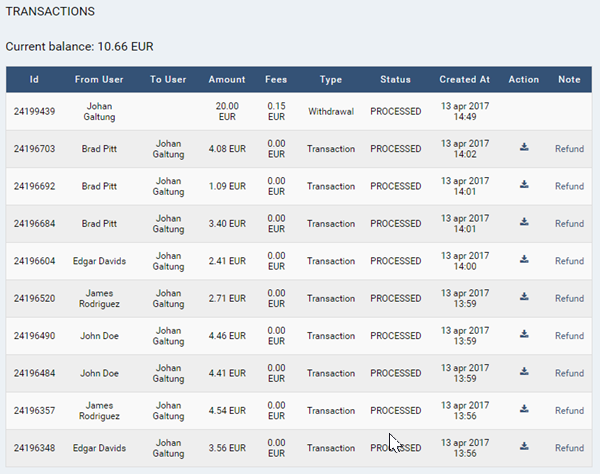 In the web menu, choose Transactions in order to view all transactions that have happened on your Moneymailme virtual wallet. A transaction where your virtual wallet is credited (your company is the beneficiary) is actually a payment received for an order made by a customer on your e-shop and paid with Moneymailme application. Click on the download-like icon in the Action column to download a receipt for the paid order. Click on Refund in the Note column to initiate a refund of a payment, in case the customer who paid wishes to return his/her order (in which case you must return his/her money as well). The amount of a refund is the amount of the order (as transmitted by your e-shop). It means that if your wallet is, for example, in EUR, but the order was in USD, the refund is done in USD. The Foreign Exchange Data section is not editable and contains: your wallet currency, the currency of the order which is refunded, the FX rate and the actual amount which will be debited from your account. The FX rates are provided by Moneymailme application. In the Refund For Order section, fill in a Refund Reason and the security code associated to your Moneymailme account, that you have received in the welcome email when you created the business account. 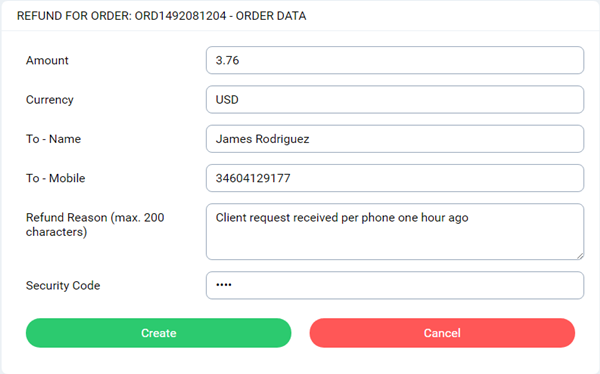 The Amount is the order amount (which will now be refunded), the Currency is the currency of the order amount, the To - Name is the person name who made the payment, the To - Mobile is the mobile phone number of the person who made the payment. Click on Create button to do a refund and return the e-money back to the customer. The refund is a transaction on your wallet and will appear on your transactions list. You will also receive an email confirming the transfer from your wallet to the customer’s wallet. Note: Go to the Before you read further section to understand more about orders in Moneymailme application.